Hello! I hope you are having a great start to your year! January certainly seemed to fly by. 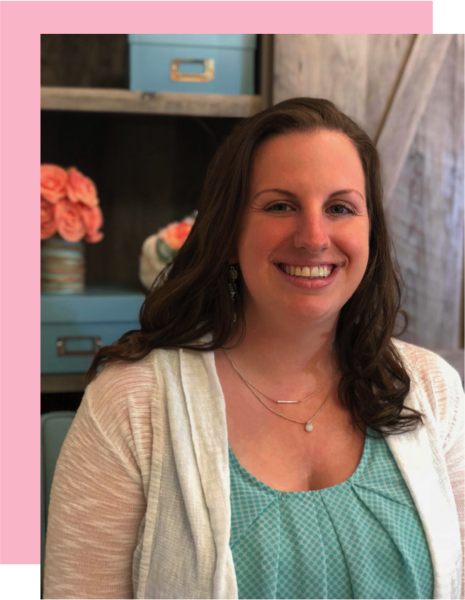 Over the summer when Theresa's Teaching Tidbits and I planned out our year of Math Tip Monday posts I knew I would be teaching place value around this time of year. Thank goodness! We have done addition and subtraction (all Operation and Algebraic standards) for the past 18 weeks and certainly can use a change. However...we are getting ready to kick off all of our place value fun over the next few weeks. Today I will share a sneak peak of some of our plans for the unit. I will be sure to come back and add photos throughout the next few weeks of the plans in action. 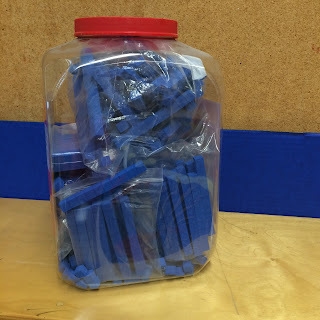 When I first started teaching place value in first grade (pre-common core) years ago, I basically thought it meant taking out some of these old trusty base ten blocks and calling it a day. Students could quickly look at a number and see that they needed some long sticks for the first digit and some cubes for the second digit. Come on now, even my students who were struggling with math could do this! I thought I was a teaching genius. Check. Standard mastered. Perhaps it's because of the way Common Core has raised the expectations for teaching math, or perhaps it's because I am now more familiar with typical first grade development...either way, playing with base ten blocks is NOT teaching place value! In fact, the first grade standard really doesn't focus on the use of base ten blocks at all! First, students need strong number sense skills. They need to be able to count. They need to be able to read and write numbers. They need to have spent time looking at various amounts and visually seeing the difference between 39 and 93. They need to come to the determination that the order of the digits in a number does make a huge difference. Then, we focus on breaking numbers apart (which is something they are familiar with after decomposing numbers with addition and subtraction). Now, we are going to be looking at larger numbers. We start by using tens frames and small numbers in the teens. I have students show me the number 12 for example. We discuss that I have 1 whole tens frame filled, and 2 leftovers in the next frame. I write 12. Little brain light bulbs start to flicker. Then we show another number, 18 perhaps. Students show me 18 counters on tens frames. How many full tens frames? How many extras? Again I write the digits and the number 18 "magically" appears. We repeat this process with a variety of numbers, eventually using multiple tens frames and partner work to display larger numbers. They are beginning to understand where the digits in a number come from. We also visually compare two similar numbers like 13 and 31. Order matters. Once students are comfortable with tens frames we start with grouping objects. I place a large handful of counters or cubes in front of me and tell them I am going to count them. I pretend to keep losing my place as I start to count. I ask for their opinions on how I could organize my materials to make it easier to count (they of course love to help me!). When the idea of putting them into groups of 2, 5, or 10 comes up I try it. I try all of their suggestions and lightly guide them to the decision that grouping by tens seems to be the most efficient. 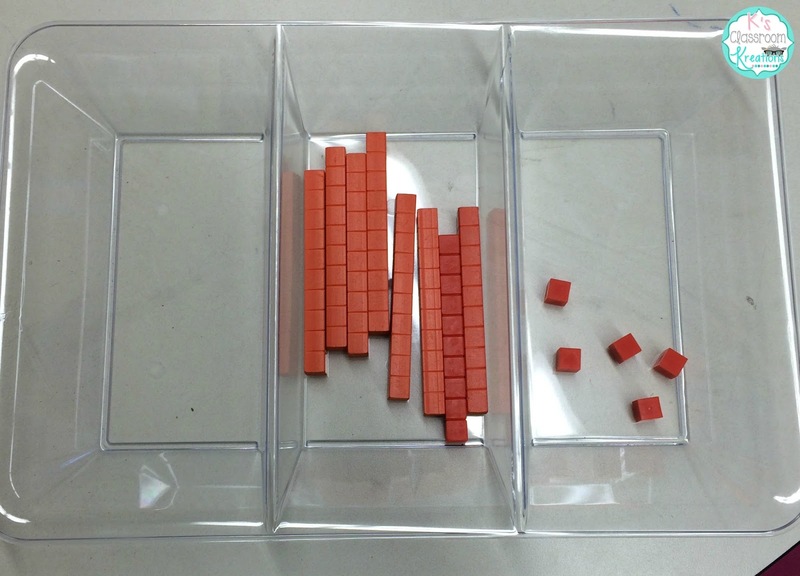 I explicitly model how I can take 45 counters and put them in to 4 groups of ten. I also will have leftover ones that can not fill another group. We skip count by 10's to 40 and then add the additional 5. Students again start to see where the digits came from. We will spend a lot of time practicing grouping objects (beans, counters, cubes, beads, cheerios, etc.) and determining how many we have. We will then move towards trading in a handful of ones for a ten to make it even easier to count (ex. we glue 10 beans onto popsicle sticks to see how those ten can become a unit). Eventually I do introduce the base ten blocks, but this is one of the final steps. 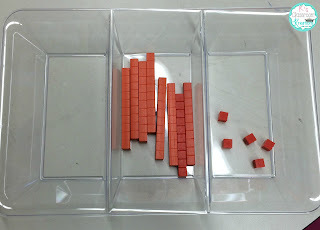 Sometimes I like to use trays like this one (from the Dollar Tree) to show place value. Students are given a handful of ones and their partner works as the "banker" to trade in ten ones for a ten. This week our three part tray is shaped like a football for Super Bowl week! The final step (and goal) when teaching place value is for my students to see a number like 78 and recognize that it means that if we had 78 ones, we could group them in to 7 groups of 10 and have 8 remaining. We do practice drawing rods (tens) and cubes (ones) to visually show this. However, it is super important to realize that many kids can learn the trick of drawing lines and squares....the true test is in how they explain the number to you and if they understand WHY they are doing this and WHAT it really represents. Sorry for the lack of pictures on this post but I promise to come back and add our action shots this week as we introduce place value. Wish me luck! Happy teaching! 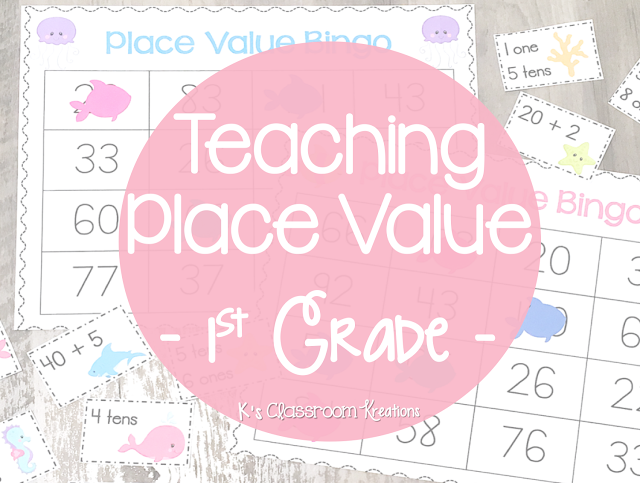 Don't forget to check out all of the other tips on how to teach place value in the primary grades.